A manufacturer of single-serve pods of cannabis called CannaKorp has raised a total of $5.7 million to help progress the manufacturer its disposable vaporizing pods. The funding includes a $1.6 million seed funding round raised earlier this year. Singularity Capital Management, a private equity firm focused on cannabis, lead the investment in CannaKorp’s Series A round. 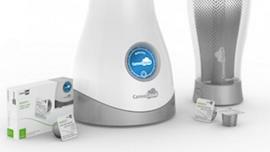 Funding will be used to help manufacture the CannKorp pods, help develop more partnerships with cultivators and dispensaries, and progress the company’s development of its CannaCloud vaporizing system in several states this year. “CannaKorp is positioned to be a disruptive force in the booming cannabis industry led by one of the most impressive teams in the space,” said Brett Rentmeester, president and chief investment officer at Singularity Capital Management, and CannaKorp board member. CannaKorp, based in Stoneham and headed by former Keurig (Nasdaq: GMCR) executive Dave Manly, had raised $3.8 million in September from a total of 21 investors, according to U.S. Securities and Exchange Commission filings, and was looking to raise a total of $5.8 million. The company has already completed early manufacturing and partnered with several dispensaries to receive product for its system. Jessica Bartlett covers health care, including hospitals, health IT, health policy and insurance, as well as the beer industry.